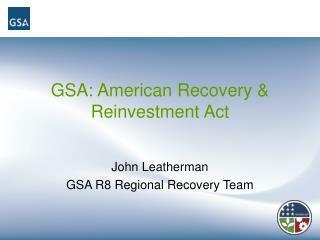 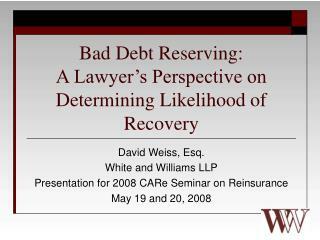 GSA: American Recovery & Reinvestment Act John Leatherman GSA R8 Regional Recovery Team Presentation Overview Who is GSA? 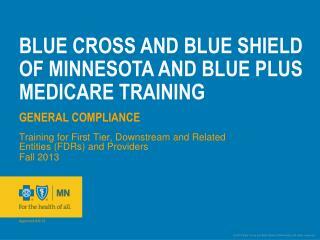 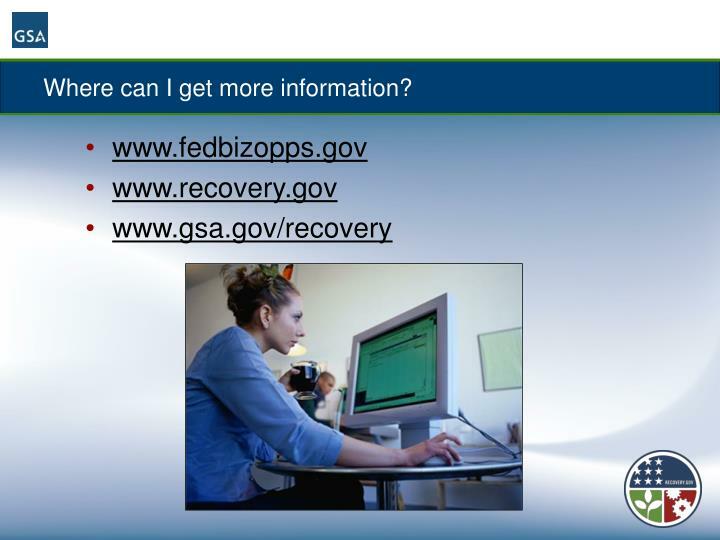 What does the Recovery Act mean to GSA? 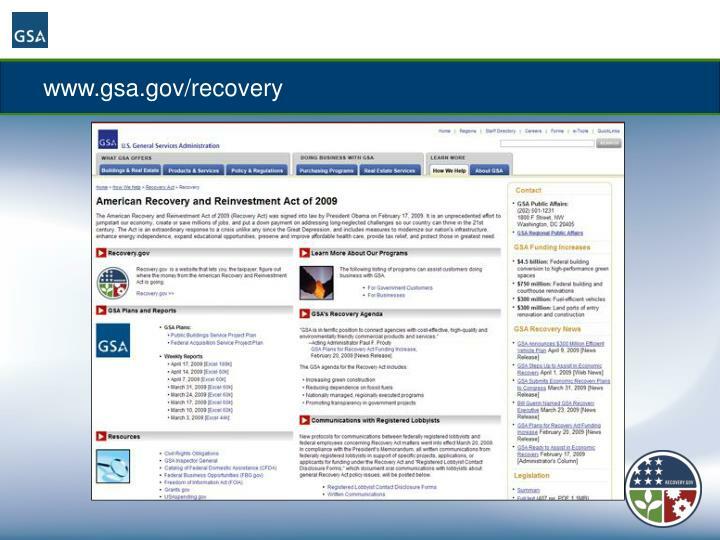 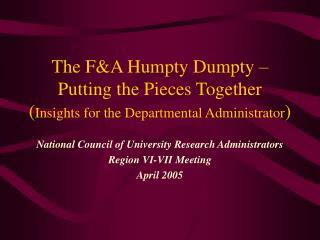 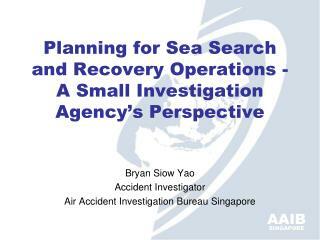 GSA’s perspective on trends, opportunities, and strategies during recovery. 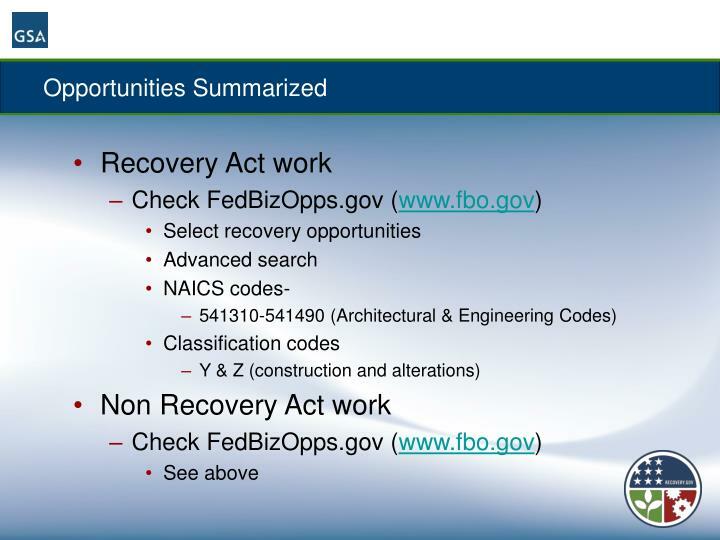 Snapshot of specific Recovery projects in Colorado. What does the Recovery Act mean to GSA? 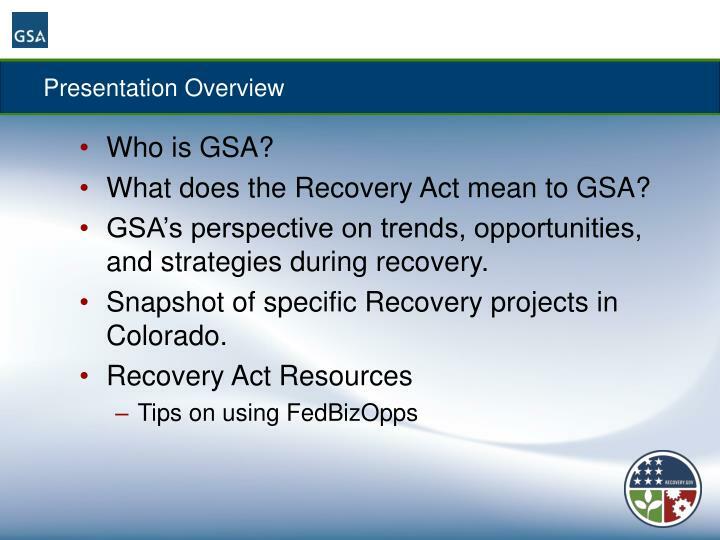 GSA’s perspective on trends, opportunities, and strategies during recovery. 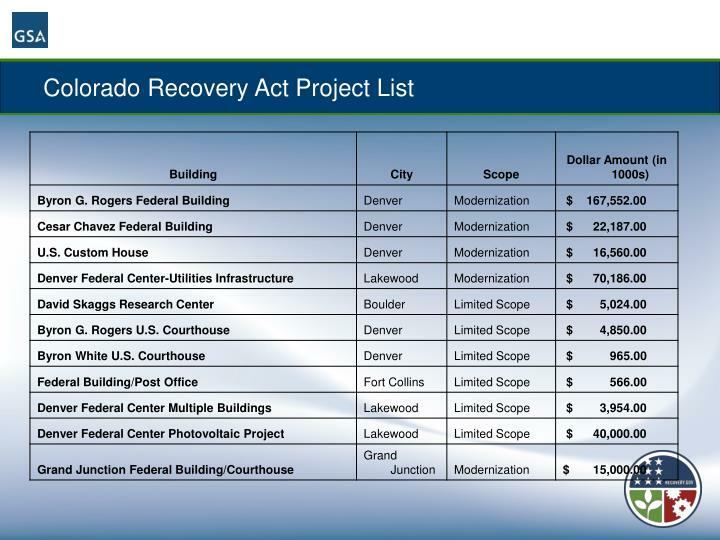 Snapshot of specific Recovery projects in Colorado. 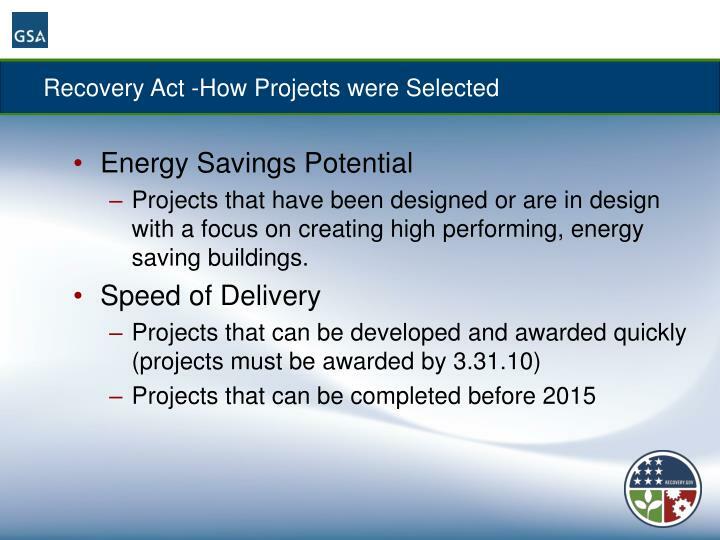 Projects that have been designed or are in design with a focus on creating high performing, energy saving buildings. 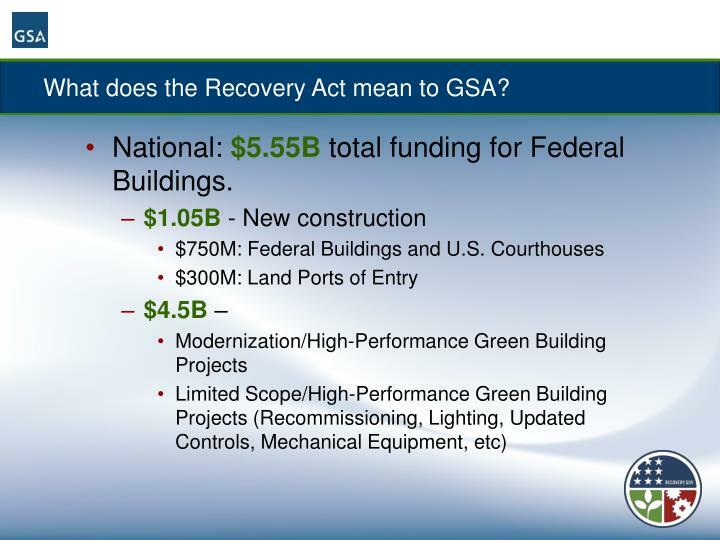 National: $5.55B total funding for Federal Buildings. 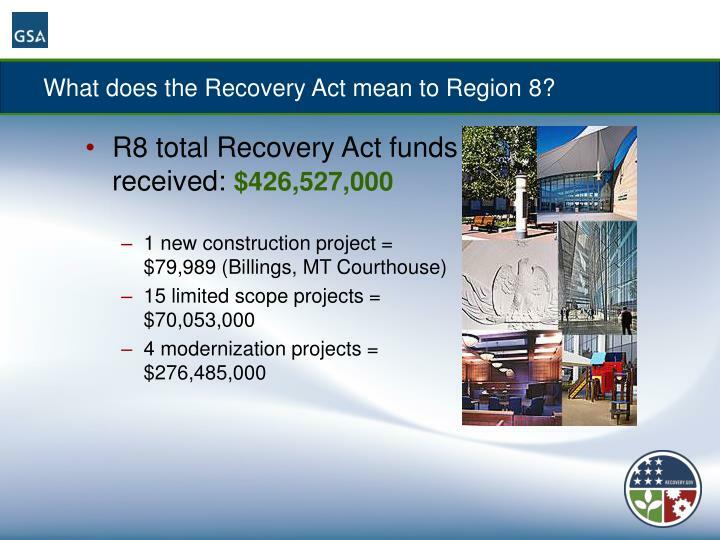 What does the Recovery Act mean to Region 8? 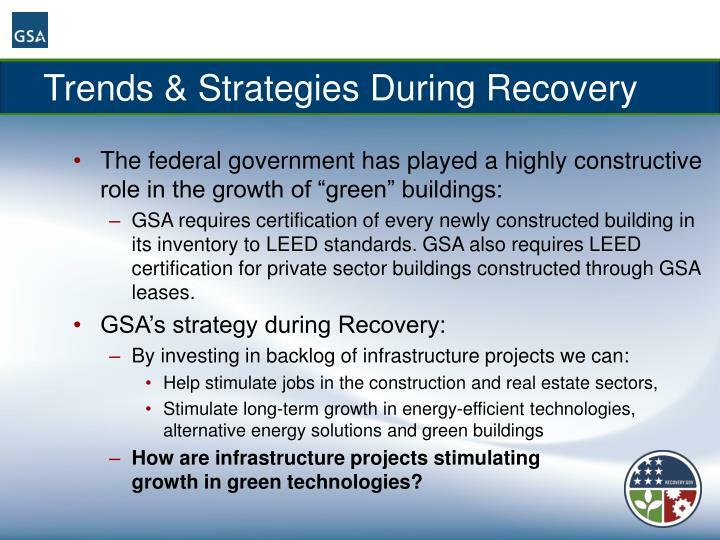 GSA requires certification of every newly constructed building in its inventory to LEED standards. 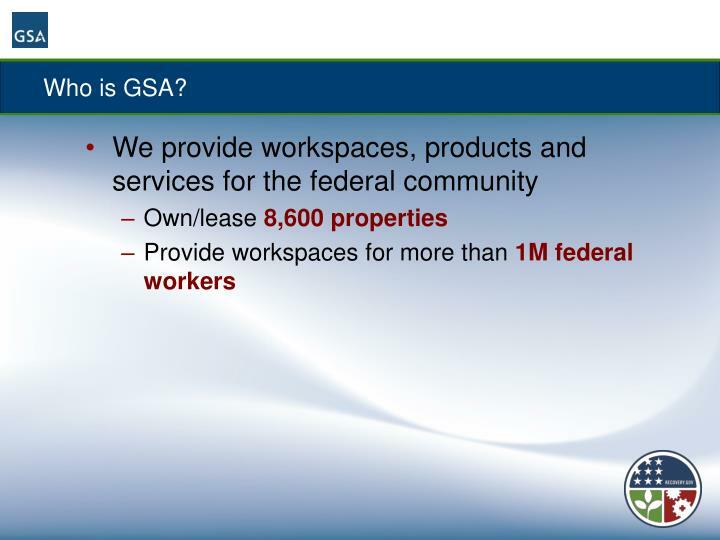 GSA also requires LEED certification for private sector buildings constructed through GSA leases. 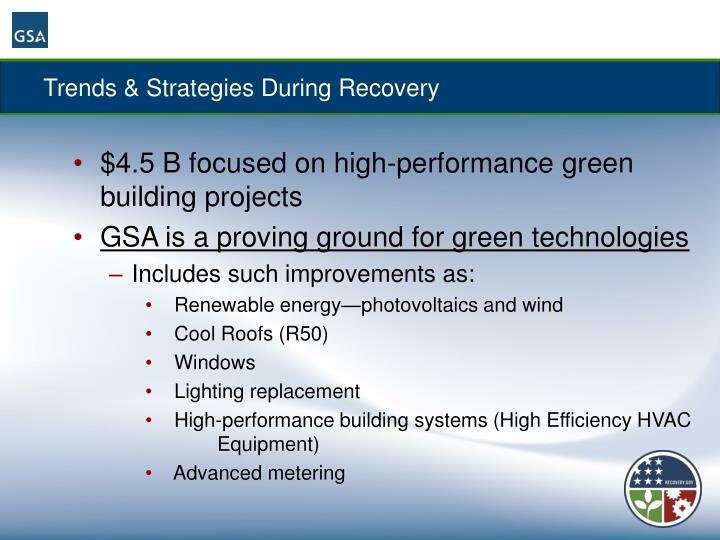 How are infrastructure projects stimulating growth in green technologies? 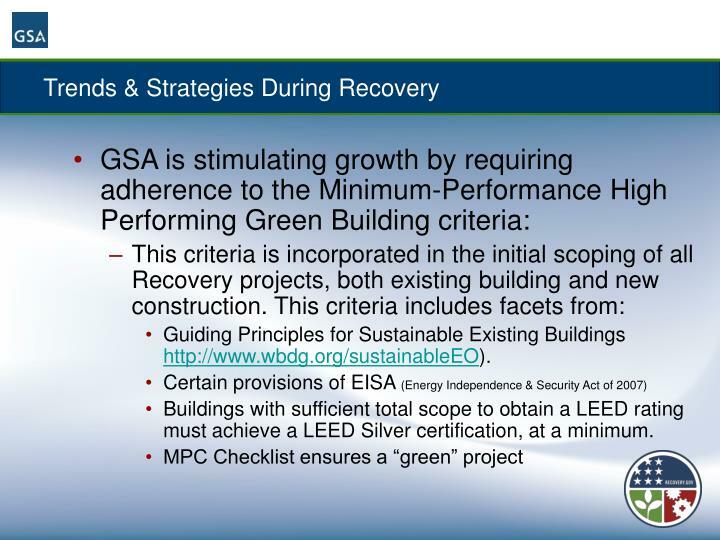 Guiding Principles for Sustainable Existing Buildings http://www.wbdg.org/sustainableEO). 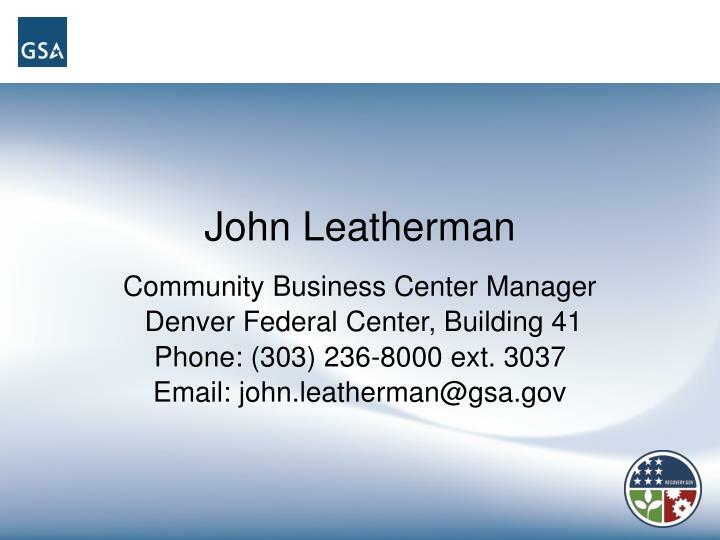 Buildings with sufficient total scope to obtain a LEED rating must achieve a LEED Silver certification, at a minimum. 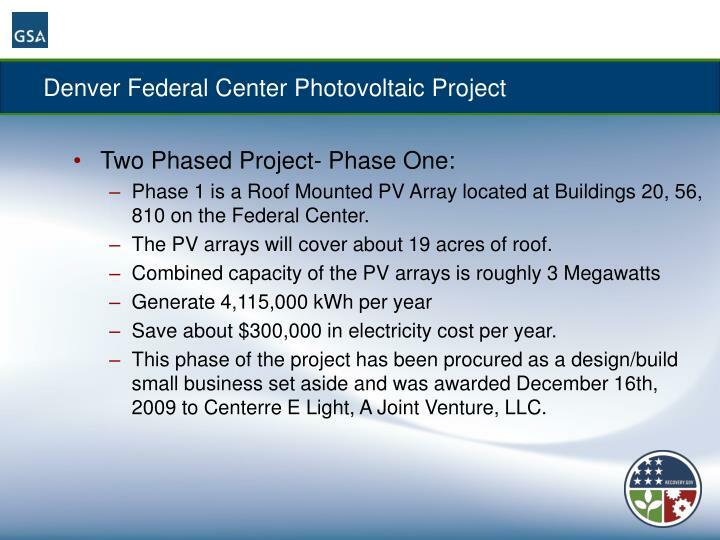 Phase 1 is a Roof Mounted PV Array located at Buildings 20, 56, 810 on the Federal Center. 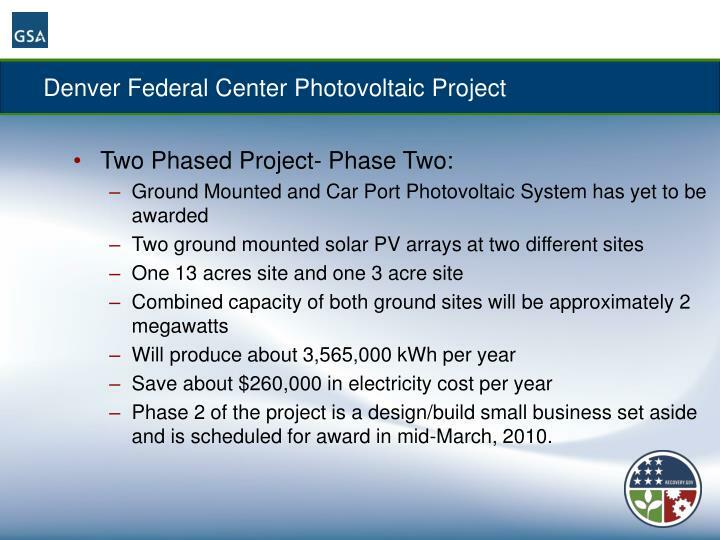 The PV arrays will cover about 19 acres of roof. 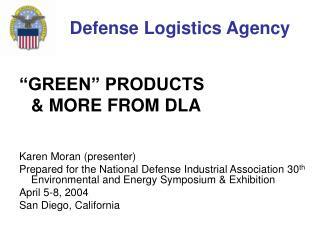 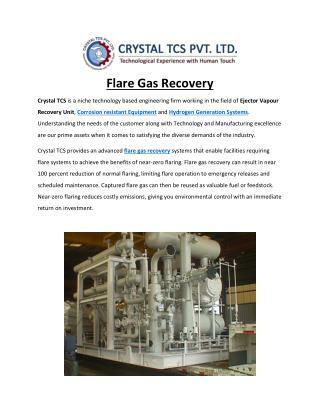 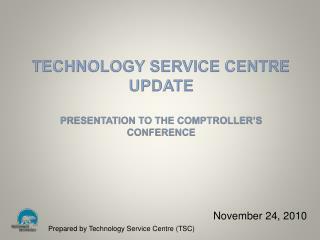 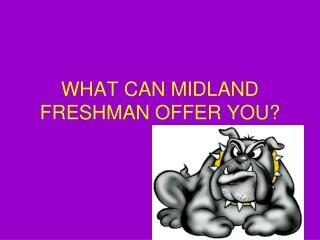 Save about $300,000 in electricity cost per year. 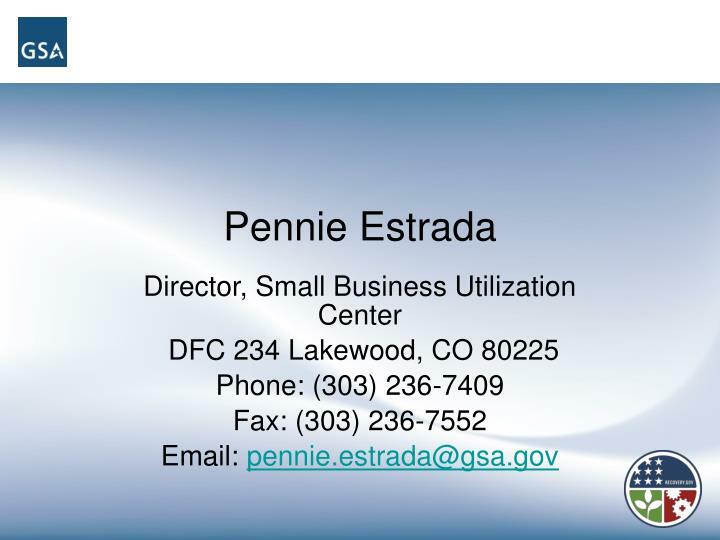 This phase of the project has been procured as a design/build small business set aside and was awarded December 16th, 2009 to Centerre E Light, A Joint Venture, LLC. 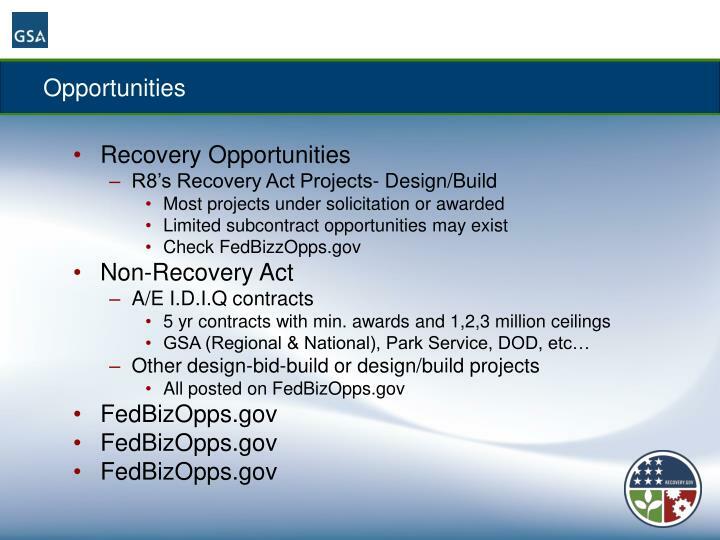 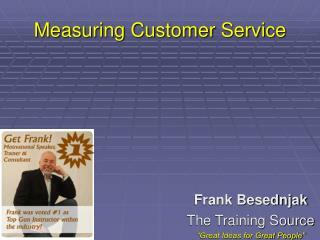 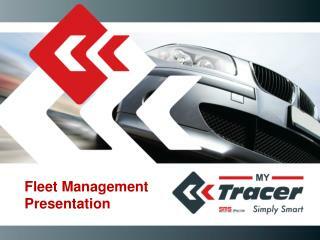 Phase 2 of the project is a design/build small business set aside and is scheduled for award in mid-March, 2010. 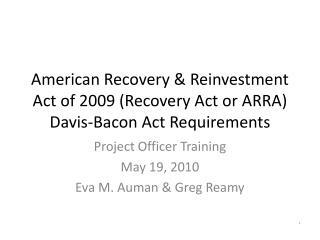 ROLE OF THE NONCOMMISSIONED OFFICER -Role of the noncommissioned officer. 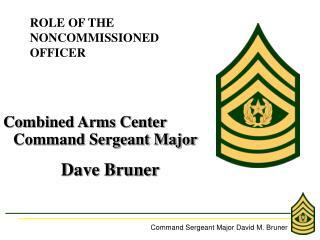 combined arms center command sergeant major dave bruner. 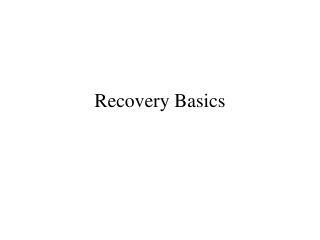 background. 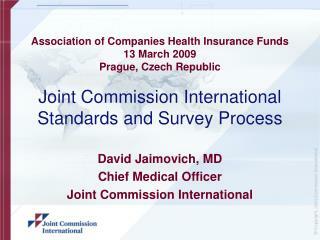 agenda. 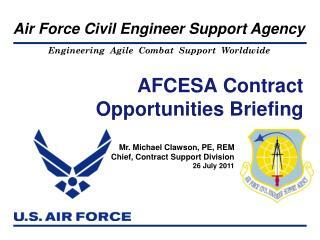 role of the nco. 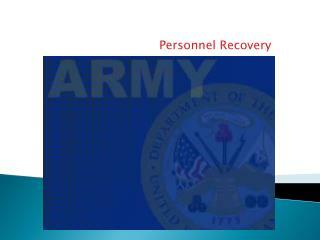 duty description of the nco. 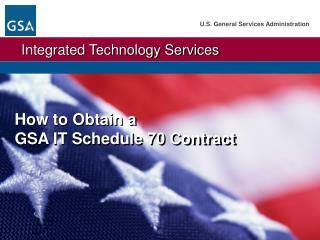 duties and responsibilities. 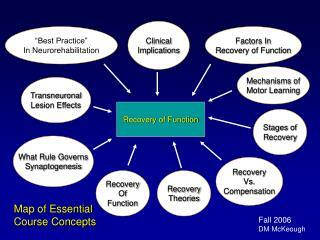 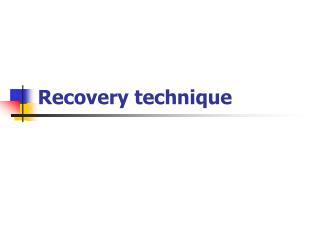 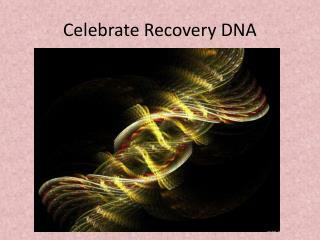 The Recovery Process -. 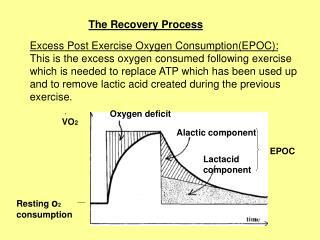 excess post exercise oxygen consumption(epoc): this is the excess oxygen consumed following exercise which is needed to replace atp which has been used up and to remove lactic acid created during the previous exercise.